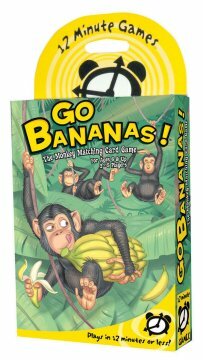 Get ready to "Go Bananas" while playing this happy, slappy card game. Be the first player to spot and slap a pair of matching opposites - a wild monkey and wild monkey - and you collect the cards. Keep your eyes peeled for rotten bananas and goofy Gotcha Gators. But be careful not to slip when you slap or else you lose cards. Collect all the cards and you win!